R & T Classics, owned by Rod Schantz, was one of the Community Builders tour stops in Newman Grove. A total of 21 people attended from the communities of Newman Grove, Columbus and Genoa. 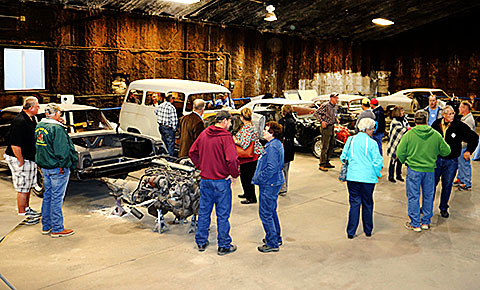 Tour stops included R&T Classics, hosted by owner Rod Schantz. The business restores classic vehicles of all kinds. The group also visited Shell Creek Market, where owner Tom Temme provided a tour; Energize Dance Studio with owner Karla Patzel; and B&M Antiques & Architectural Salvage with owners Jim, Esther and Brad Cox. Dinner was served at the City Cafe by owners Adam and Dawn Witchell. A program was presented on the town’s downtown improvement projects was given by Newman Grove Mayor John Wyant. Community Builders helps individuals in Colfax, Boone, Nance and Platte counties learn ways to improve their communities. Sponsors are Cornhusker Public Power District, Loup Power District and Central Community College.